The new lake at Float Fish Farm Fishery. It’s exciting times over at Float Fish Farm Fishery. They’ve been busy during the winter months digging out a brand new lake and it is expected to be a real winner on the complex. Shrubs and trees have already been planted and over 30 pegs have been positioned. 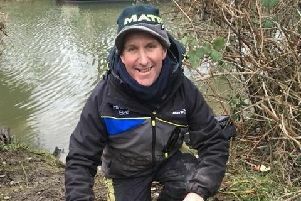 Over the past few weeks it’s been filling up with water and fishery bosses Elaine and Dale Hudson say they have already begun a massive stocking programme well before it opens up to anglers in late spring. The lake will be called Phoenix and already some of our local clubs have made match bookings on it. So for more information or to book in give the fishery a call on 07764 242731. 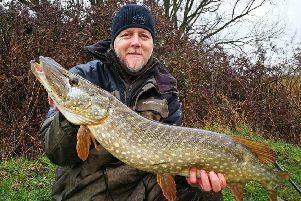 The fishery also have plans for another new lake, a huge three-day festival and a couple of two-day events. Whittlesey AA, Carrot Wash: 1 John Taylor 6lb 9oz; 2 Jeff Tuttlebee 5lb 15oz; 3 Andy Lawrence 5lb 3oz. Tydd Gote Angling Club, Main Road: 1 Andrew Kil 9lb 11oz; 2 Archie Greenwood 7lb 13oz; 3 Steve Borrett 4lb 6oz. Tydd Gote Angling Club, Wednesday Open, Main Road: 1 Sammy McSpadden 6lb 10oz; 2 Archie Greenwood 6lb 2oz; 3 Darren Williams 4lb 5oz. Ramsey & District AS, Old Nene, Ramsey St Mary’s, Wednesday: 1 John Locke 20lb 14oz; 2 Keith Rayment 12lb 2oz; 3 Stu Cheetham 11lb 3oz. Ramsey & District AS, Old Nene, Ramsey St Mary’s, Sunday: 1 Malcolm Plant 11lb 7oz; 2 Paul Kilby 9lb 4oz; 3 Stu Cheetham 8lb 4oz; 4 Harry Young 8lb 2oz.